It's a serious illness that needs to be treated. 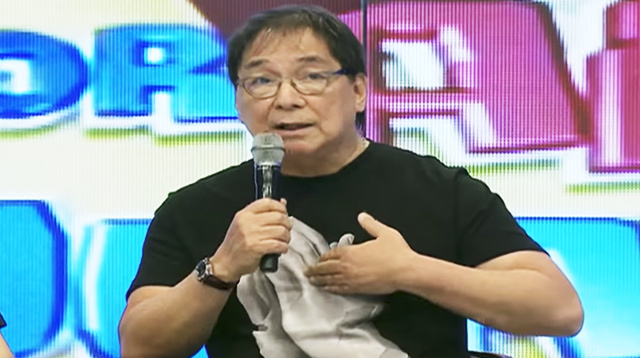 On October 5, 2017, Joey de Leon dismissed depression as something made-up: “Gawa-gawa lang ng mga tao ’yan. Gawa lang nila sa sarili nila.” That was his response after finding out that a contest winner’s mom is diagnosed with depression. While he has every right to respond in any way he wants, it doesn’t change that his statement, broadcast to all the people watching Eat Bulaga, is erroneous and ignorant. It’s also counterproductive to those with depression but don’t know it, and to those who wish to help them but don’t know how. We concur with Joey on that note, so we’ll debunk his misinformed statement because there are other people who agree with it. Depression is not made-up; it’s a real mental disorder. The proof? Depression is listed in the Diagnostic and Statistical Manual of Mental Disorders (DSM). Published by the American Psychiatric Association, the DSM is used by clinicians, researchers, health insurance companies, pharmaceutical companies, legal systems, and policy makers all over the world. All these professionals and institutions rely on the DSM for a standard criterion or classification of mental disorders, so that they can deal with people better, contribute to the research of mental disorders, and develop medications and other treatments. At present, the DSM is on its fifth edition. Since the DSM’s first release in 1952, mental disorders have been added, and those no longer considered to be mental disorders have been removed. In the case of depression, it was in the DSM from the very beginning. Formerly listed as “depressive reaction” in 1952 then “depressive neurosis” in 1968, depression was called “major depressive disorder” or “clinical depression” in 1980, and both terms are used until today. Depressed mood most of the day, nearly every day; feels sad, empty, hopeless. For someone to be diagnosed with major depressive disorder, the said symptoms must be present for two weeks and change how the person behaves. The person would experience difficulty socializing, going to school or going to work, actually studying or working, and other functional activities. This is where people ignorant or misinformed about depression come in. They think people make those hasty and awful conclusions up—for whatever reason—when they can be happy instead. But it’s not easy to just be happy. In fact, contrary to the words of de Leon’s co-host Wally Bayola, “Ang sagot diyan, dapat happy lang. Happy lang,” depressed people cannot just be happy—as if many of us who are going through something can just snap out of it on command. Depression, being so complex, has several causes. And unless these causes are looked into, the person suffering from depression can’t or will have immense difficulty functioning, let alone looking and being cheery. The mental disorder can be caused by a traumatic event in one’s life: losing a loved one, getting injured, or becoming unemployed. It can be caused by genes that make individuals more vulnerable to mood swings and how they respond to drug therapy. Depression can actually be inherited. And when genes cause it, depression is clearly and all the more not something someone asked for or inflicted upon himself. Other people have depression in the dark days of winter; this is a subset of the illness called “seasonal affective disorder.” Other people have depression as a symptom of another mental disorder (like bipolar disorders or premenstrual dysphoric disorder) or of another medical problem (like diabetes, arthritis, and HIV/AIDS). So much goes on on a biochemical level in our bodies. Different and various chemical reactions—we’re looking at millions, even billions of them—inside and outside our nerves. These are all responsible for our moods, perceptions, and how we experience life. For people struggling with depression, these millions of chemical reactions all boil down to their not being able to lift their spirits for a prolonged period. Fortunately, depression can be treated. When you or someone you know is exhibiting the symptoms of depression, see a doctor or therapist or have your loved one see one to check for depression. The treatment given will depend on the severity and the cause of the depression. Antidepressants may be prescribed, for instance, to regulate the hormones or chemical reactions in the brain. Some are made to undergo psychotherapy to help sort out and understand their thoughts and feelings, and find out what would help them feel better. In severe cases of depression when medication and psychotherapy don’t help, electroconvulsive therapy may be done. This sends small, painless electric currents to one’s brain to relieve depression symptoms. Unfortunately, even if there are effective treatments, about two-thirds of people with depression don’t seek the appropriate one. They think that depression is a phase they can snap out of; they’re not aware of its symptoms; or they’re embarrassed to seek help. Yet it’s so important to get treated for depression, especially since it can become severe. When left untreated, the consequences are grave not only on the person struggling with it but also on his circles. Personal and professional relationships are strained and can break, hurting other people and aggravating the depression. Health problems can develop or worsen (again, depression can be a symptom of another illness). The worst is that it drives the individual to commit suicide. Depression is a difficult and serious reality that people go through—and getting it is out of their hands. And part of that difficulty is that those of us who don’t know what’s going on can’t sympathize or empathize. Some of us stigmatize those who have it. And there are others still who are skeptical about how real the depression is. It’s the kind of skepticism that doesn’t push them to Google “depression” to know more about it. Hopefully, Joey’s apology and other incidences related to depression can help us suspend our harshness. It’s in many people’s best interest that we overcome and help others overcome this very neglectful, contemptuous skepticism that makes us forget what’s more important than the technicalities of mental illness (in a social and casual setting): to recognize that someone is suffering one way or another and needs some help; and help.